The widely anticipated revision of this worldwide best-seller incorporates the latest developments in operating systems (OS) technologies. The Fourth Edition includes up-to-date materials on relevant¿OS. 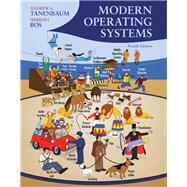 Tanenbaum also provides information on current research based on his experience as an operating systems researcher. Andrew S. Tanenbaum has an S.B. degree from M.I.T. and a Ph.D. from the University of California at Berkeley. He is currently a Professor of Computer Science at the Vrije Universiteit in Amsterdam, The Netherlands, where he is head of the Computer Systems Department. He is also the Dean of the Advanced School for Computing and Imaging, an interuniversity graduate school doing research on advanced parallel, distributed, and imaging systems. Nevertheless, he is trying very hard to avoid turning into a bureaucrat. In the past, he has done research on compilers, operating systems, networking, and local-area distributed systems. His current research focuses primarily on the design of wide-area distributed systems that scale to a billion users. This research is being done together with Dr. Maarten van Steen. Together, all his research projects have led to over 90 refereed papers in journals and conference proceedings and five books. His Ph.D. students have gone on to greater glory after getting their degrees. He is very proud of them. In this respect he resembles a mother hen. Prof. Tanenbaum is a Fellow of the ACM, a Fellow of the IEEE, a member of the Royal Netherlands Academy of Arts and Sciences, winner of the 1994 ACM Karl V Karlstrom Outstanding Educator Award, and winner of the 1997 ACM/SIGCSE Award for Outstanding Contributions to Computer Science Education. He is also listed in Who's Who in the World. His home page on the World Wide Web can be found at URL http://www.cs.vu.nl/~ast/ .